Tjene was established in 2010 by its three founding partners, Calvin Yoa, Eric Tang, and Nicholas Chu. Each came from years of high-level consulting experience within BearingPoint and KPMG, and the partners saw a need in the industry for customized, efficient, and malleable solutions to complex technology implementations. Since inception, the team at Tjene has played an integral role in helping client organizations create value. We recruit truly outstanding people and provide them with high-quality assignments, rigorous training, support in a highly collaborative environment, and the international opportunities needed to flourish professionally and personally. The result is a proven implementation methodology backed by an unparalleled record of success. Tjene is committed to providing tangible result-based consulting, quick turnaround on deliverables, open communication, and genuine client relationships. At Tjene, we foster a highly collaborative environment with a focus on knowledge-sharing and collective problem-solving. From weekly lunch-and-learns to internal training courses, we encourage team-building, leadership, and make continuous learning a priority. The results of this team culture speak for themselves - we have a highly-skilled team, wonderful relationships with our clients, a robust history of successful projects, and most importantly - a positive and encouraging culture for our employees. Tjene’s industry purpose is to serve our clients with world-class solutions and methodologies. With offices in Toronto and Dallas, we are a uniquely cohesive unit in an industry where reliance on remote workers are the status quo. As a result, we have built a robust knowledge-base and are able to provide very quick turnaround time on deliverables. We focus on cross-training our consultants to serve both functionally and technically, and we foster a progressive approach to new technologies - which has resulted in creative solutions and proprietary technologies developed in-house. All great business is founded on successful relationships, so we make communication and building strong partnerships a core value. Tjene cares about community and initiative. We promote a culture of thinking bigger than ourselves and serving our neighbours. It is important to us that our influence in the industry results in a positive and long-lasting impact. Our new and exciting opportunity to serve alongside a local charity who specializes in disability and support services for families with special needs. In celebrating Village Eulogia's anniversary, we took part in organizing an Art Auction for the event in hopes to further fundraise the community support of compassion, aid, love, and spiritual health for families who have a child with special needs. Walking alongside families and friends from the Village Eulogia community at the scenic Thomson Memorial park, we had the opportunity to host this year's walkathon fundraiser. Altogether with the Village Walkers and their supporters, we were able to reach their goal of raising just over $20,000! As a team, we stepped outside our regular 9 to 5 office hours to grab some shovels and plant various trees along the borders of Spruce Park. 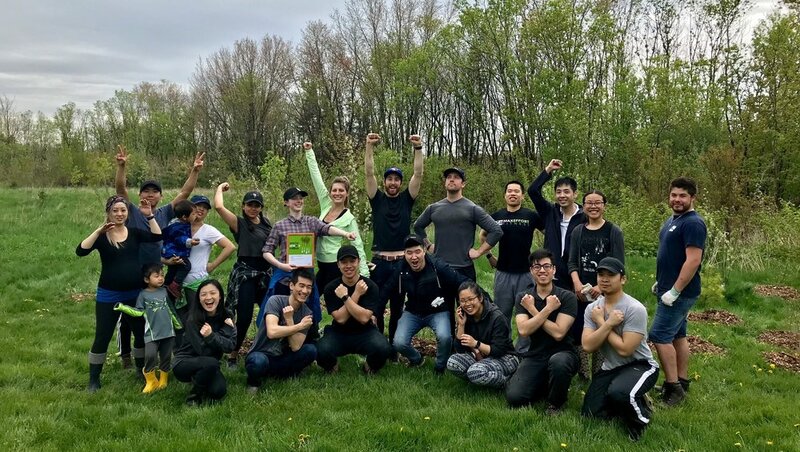 Together, we planted 198 trees, bringing the City of Mississauga one step closer to meeting their goal - "1 million trees by 2032!" As part of Canada's tech and innovation community, we strive to connect technology to where it is most needed. With employees who have personal experiences at SickKids, we have decided to invest in "tech4SickKids" - an investment that will bring technology and innovation to where SickKids would thrive without limits. Holland Bloorview Kids Rehabilitation Hospital Foundation specializes in providing care and creating possibilities for kids with disabilities. Our involvement with Holland Bloorview stems from the appreciation of how the hospital has positively impacted some of our employees’ families. As one of our Partners takes on the opportunity in joining the Holland Bloorview Catalyst Council, we hope to create a greater awareness in fundraising for the hospital - to reach higher possibilities in both their innovative technologies and life programs for those within their care.